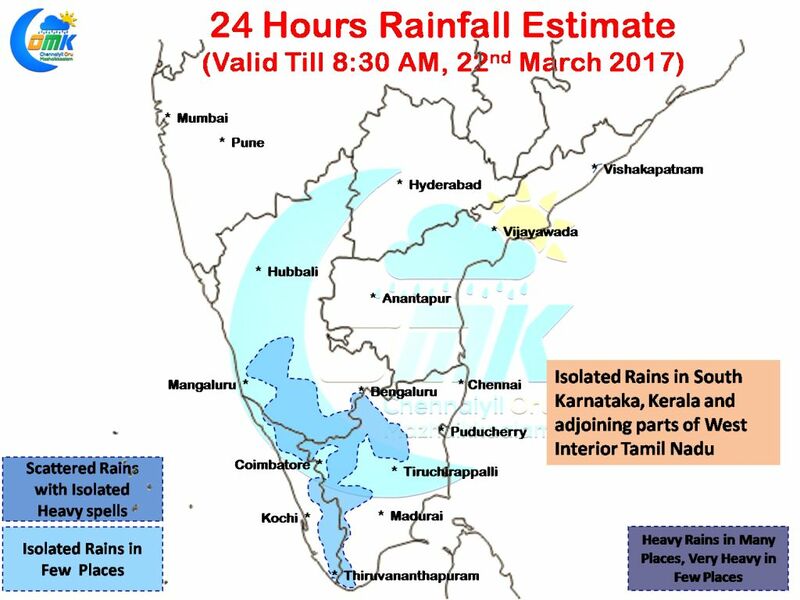 As early summer conditions prevails over parts of interior Tamil Nadu yesterday saw isolated rains in many parts of Western Tamil Nadu in the districts of Coimbatore, Erode, Tiruppur, Namakkal & Krishnagiri districts. Karur after crossing 40 degrees for the second straight day saw moderate rains in the evening bring in much needed relief from the day time heat. 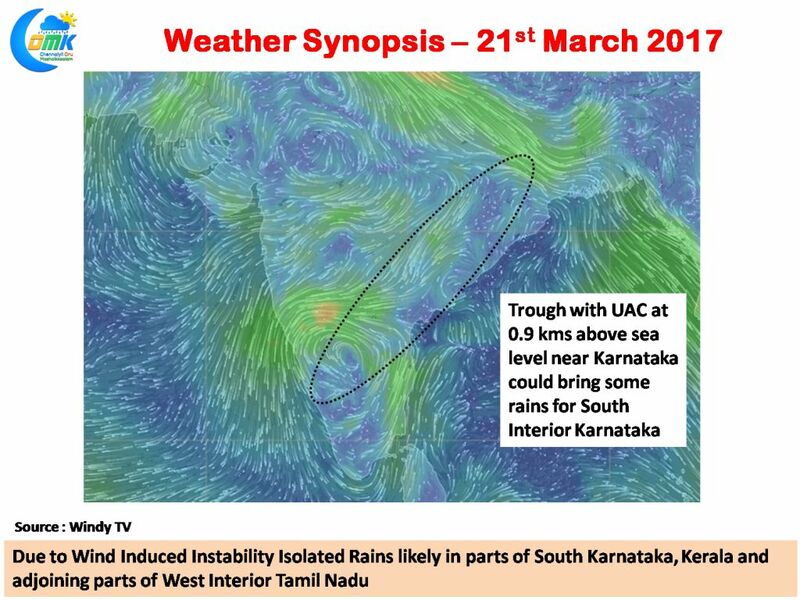 With a trough persisting from West Bengal to Tamil Nadu along the Peninsular India their exists a wind instability that is likely to trigger some rains in the interior parts of Peninsular India today as well. There exists a weak upper level cyclonic circulation over the South Karnataka areas that is likely to bring these rains after the day time ground radiation creates the necessary imbalance in the air particles making it conducive conditions for atmospheric instability to set in. Parts of South Karnataka is likely to see a spell or two of rains with one or two places getting moderate to heavy spells at times along with adjoining parts of Kerala & West Interior Tamil Nadu. Parts of Erode, Tiruppur, Coimbatore, Dharmapuri & Krishnagiri districts have a chance for these evening rains in a few places. Rest of the state is likely to see fairly dry conditions with warm day ahead. Numerical models though indicate a slight easing of temperatures in the interior places compared to the last couple of days.